The e in its name stands for enhanced, and that’s what it was. Some important features that many users had installed in the Apple II Plus were now standard, most notably support for upper- and lower-case text without a keyboard hack. Also new to the keyboard were directional cursor keys, Tab and Delete keys, the Open Apple and Solid Apple keys, and moving the Reset key to a location where it was less likely to be struck accidentally. For the first time, an Apple II computer shipped from the factory with 64 KB of system memory as its standard configuration, giving it the equivalent to the Apple Language Card built into the computer. There is also built-in support for 80-column text, which had been a popular add-in card for years on the II Plus. As if that wasn’t enough, the Apple Extended 80-Column Text Card also expanded RAM to 128 KB. Best of all for Apple II and II Plus owners, they could upgrade to the Apple IIe system board – but not the keyboard. What About the Apple III? Apple had introduced the Apple III in May 1980. It was intended to replace the Apple II for business, so it had a numeric keypad, built-in floppy drive, and support for 80-column text. It had a 2 MHz 6502 CPU, so it was twice as powerful as the Apple II line. It could emulate the Apple II Plus, making much existing software mostly compatible. The Apple III was never meant to be fully compatible with the Apple II line, and Steve Jobs insisted that it have no noisy cooling fan, so it would overheat, causing some chips to come loose on the system board. This could be fixed by turning off the Apple III, lifting it a few inches, and dropping it to reseat those chips. Apple stopped production, the first 14,000 machines were recalled, and Apple eventually made the Apple III more reliable and reintroduced it in late 1981, but the damage to its reputation couldn’t be repaired. Apple sold less than 75,000 Apple III machines. Apple cofounder Steve Wozniak attributes the failure of the Apple III to its being designed by the marketing department, not engineering. The ill-fated machine remained in Apple’s product line until April 1984, and the Apple III Plus lasted until September 1985. The abysmal failure of the Apple III was the reason Apple introduced the Apple IIe, and Apple believed the IIe was going to be a stopgap until it solved the problems of the Apple III. Instead the Apple IIe went on to have the longest production life of any Apple computer, remaining on the market until November 1993. Yes, it’s a horrible pun, but Apple named its disk operating system for the Apple III Apple SOS (pronounced applesauce for Sophisticated Operating System to make the pun work). Sophisticated, yes, but incompatible with Apple DOS 3.2.1 and 3.3, forcing Apple III users to boot the older OS when they needed Apple II apps. ProDOS was based on Apple SOS, not Apple DOS 3.3, so it required a conversion utility to read or write DOS 3.3 disks. Released in October 1983, it was destined to take over the Apple II world – but until that happened, Apple would ship the IIe with both DOS 3.3 and ProDOS. Because DOS 3.3 and earlier didn’t have support for 3.5″ disks or hard drives – that required major patches to the operating system – ProDOS was destined to replace it moving forward. Shortly after the Apple IIe was introduced, Apple engineers discovered that they could use a new 560 pixel Double High Resolution graphics mode, also boosting colors from 6 to 15, by making some revisions to the logic board. Revision B machines have this feature; Revision A ones cannot support Double High Resolution graphics. Apple updated the case and keyboard of the Apple IIe in 1984, moving to darker keycaps and concave keys in a case made of dyed plastic rather than a painted case. You can compare them in the first two images accompanying this article. The 1984 revision looks a lot more modern and professional than the original in the second photo. This was also the year they introduced the Apple IIc, an Apple II machine with a built-in floppy drive, a handle for portability, and no expansion slots. 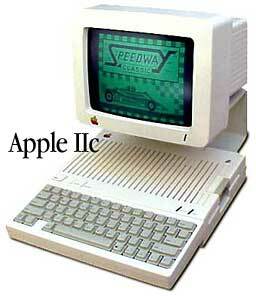 For home users, it was a hit, but power users wanted slots, so Apple kept the IIe in production. Apple introduced the Enhanced IIe (remember, the e already stood for enhanced, so maybe we should call this one doubly enhanced). The update moved from the original 6502 CPU to the newer 65C02 already being used in the IIc. The 65C02 includes some new instructions. The new revision also allows the use of lower-case text in AppleSoft BASIC. An upgrade kit was made available to owners of older Apple IIes. The final revision of the Apple IIe arrived in January 1987 and used the same “platinum” grey color that would be used with the Mac II and Mac SE later in the year. It also took a very useful feature from the Apple III – a numeric keypad. This gave the Platinum IIe the same key layout as the Apple IIGS, Apple’s top-end Apple II model that had been introduced in September 1986. The Platinum IIe has a more modern look: No more big badge identifying the model. Instead it has Apple IIe – in the same Apple Garamond typeface used with the Mac Plus and Apple IIGS – silk screened on its case. The Extended 80 Columns Card was preinstalled at the factory, and the Platinum IIe shipped with 128 KB of memory. This model was phased out in November 1993, making it the longest lived model in Apple history. It outlasted the newer, faster Apple IIGS by almost a full year. But that was not the end of the IIe! The Apple II was popular in schools, and that created an obstacle to getting Apple’s newer Macs through the door, since they were not at all compatible with all that old Apple II software. Introduced in March 1991 for use with the Mac LC, the Apple IIe Card includes a 65C02 processor, and a port for a Y-cable that supports a 5-1/4″ Apple II floppy drive and an Apple joystick, along with a 3.5″ disk with software that let the user switch from Mac to Apple II. The Y-cable is essential to using the Apple IIe Card, so if you’re looking for one, make sure the cable is included with the card. The Apple IIe Card software can still be downloaded from Apple. The LC handled video output, and Apple offered a 12″ color display with 512 x 384 pixel resolution optimized for use with the Apple IIe Card, which pushed the card to 560 x 384 pixels. You can create a ProDOS partition on the host Mac’s hard drive. 20 MB is the maximum partition size ProDOS supports, and most users find 8-10 MB to be optimal. Partitioning will overwrite anything on your hard drive, so back up your Mac partition to another drive before adding the ProDOS partition. The Apple IIe Card normally runs at 1 MHz but also offers a 1.9 MHz accelerated mode that is incompatible with most games that use graphics. The board has 256 KB of onboard memory, half of it used when the host Mac uploads the Apple IIe ROM image to the IIe Card. The card can access up to 1 MB of Mac memory, and all Mac apps are suspended while the IIe Card is active. The Apple IIe Card requires 24-bit addressing and is compatible with the Mac LC, LC II, LC III, LC III+, Color Classic, Colour Classic II, Quadra 605, Performa/LC 520, Performa/LC 550, and Performa/LC 575 (the Performa/LC 580 is not supported, nor are the Performa/LC 630 series or the Quadra 630, since none of these support 24-bit mode). 68040-based Macs in the Perform/LC 5xx Series will not recognize the IIe Card when there is a card in the Comm Slot; any such card needs to be removed before the IIe Card will work on these models. The Apple IIe Card works with Mac System 6.0.8 through 7.5.5, the last version to support 24-bit mode. It was discontinued in May 1995, just over four years after it had been introduced. Next time, we’ll look at the Apple IIc, and after that we’ll move on to the Apple IIGS, the last new design in the Apple II family.